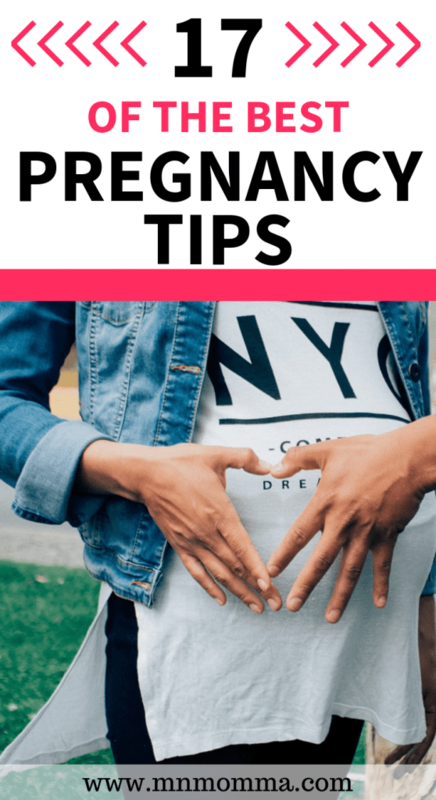 Whether you’re newly pregnant or patiently waiting for your baby to arrive, these tips for an easier pregnancy are for you! I truly loved being pregnant – but that being said, any pregnancy tips were welcome. I experienced morning sickness, uncomfortable sleeping, and several other common pregnancy challenges that many new moms face. These pregnancy hacks will help you feel more like yourself and ready for your baby in no time! You just found out you’re pregnant and BAM. The nausea and morning sickness hit, so much for an easier pregnancy. Just what every new expecting mom wants right? Thankfully there’s a few quick remedies that just might help you curb your nausea. Preggie Pops are a genius invention for those battling morning sickness during pregnancy. The variety of flavors, lemon, tangerine, etc. are specially designed to help fight nausea. Since Preggie Pops are hard candies, they are slower to dissolve and don’t hit your stomach the same way food does. Helping you (hopefully) keep them down and relieve your morning sickness. Lemon drops work to help reduce nausea in the same way as Preggie Pops – are are a cheaper alternative if you’re okay without having the variety of flavored candy. The lemon flavor is supposed to help reduce nausea due to its stomach soothing properties. A key to morning sickness is having a little something in your stomach at all times. Putting crackers next to your bed and eating a few before even trying to get up is one of the top tips to relieving morning sickness. We all know that a prenatal vitamin during pregnancy is a must. However, sometimes pregnant moms just can’t stomach them! One of the best pregnancy tips to try is to change your vitamin time. Instead of first thing in the morning, try taking your vitamin with supper instead. You just might find some great relief! This trick worked wonders for me with my first pregnancy. Another tip is to try a gummy prenatal vitamin (this pregnancy, I’m loving these!). Some pregnant moms are able to stomach the gummies better and typically the flavors are ones that help reduce nausea! For me…these are just more fun and easier to remember to take! Staying hydrated is another key to helping reduce your pregnancy nausea. It’s important to make sure you’re drinking enough water for not only yourself, but for your baby. Find a water bottle that’s big and set a goal for yourself. It’s much easier to keep drinking your water when your goal is 2 big bottles, as opposed to 8 little ones. If you really can’t stand the taste of water, add lemon (a nausea fighting agent!) or other fruits in a diffuser like this one. During pregnancy, your growing body is probably going to need some new clothes. Fortunately, there’s a way around an entire new wardrobe that you’re only going to wear for 9 months. 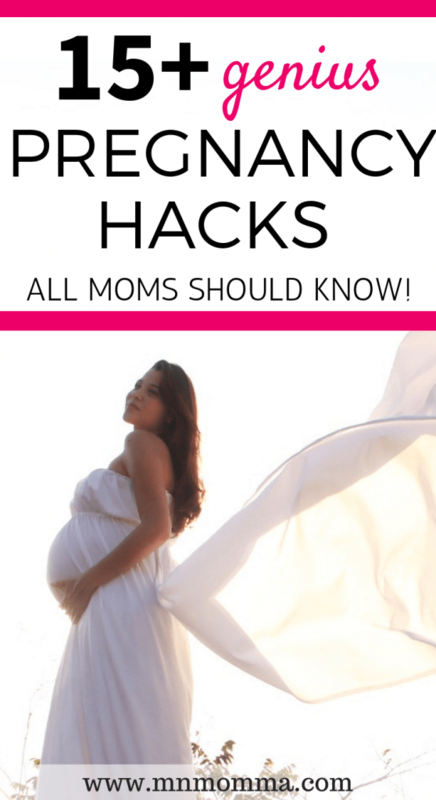 These maternity clothing hacks will have you saving money and space in your closet in no time! Do you know how many pairs of maternity pants I own? TWO. While there’s sure something to be said about comfy maternity pants, it’s great when you can still wear your favorite pants AND be comfortable. Belly bands are amazing. Make your pants last as long as possible (if not your whole pregnancy!) with a few strategically colored belly bands. If you’re crafty, or if you’re not, making your own belly band is super easy! Simply cut an old tank top and you’ll be set! Finish the end with a nice stitch and your belly bands will look like you bought them. For the full tutorial, click here! If you want an even more frugal hack, the hair tie trick is for you. I have to tell you, it’s not as comfortable as the belly band, but in a pinch, it’ll work! Just loop your hair tie through your button hole and slip the other side around the button. One of the basic expectations of pregnancy is that your breasts will grow. For some women it happens almost as soon as they see that positive pregnancy test, while others won’t notice until the third trimester. Whenever it happens for you, you might find yourself needing a new bra! Not so fast…your breasts will likely continue to grow during your pregnancy or after your baby is born when your milk comes in. You can save a lot of money by waiting to buy your maternity bra until later. Okay, so what are you supposed to do in the meantime? Grab these super easy bra back extenders! Simply sew them to your current bra and you’ll be set. Learning how to get comfortable sleeping while pregnant can be a trick in and of itself. You’re no longer supposed to be sleeping on your back and sleeping on your stomach gets complicated pretty quickly. Some women also find that their belly will pull one way or their back or hips will ache. Well momma, there’s a few simple tricks to help relieve the dreaded pregnancy sleeping. While pregnancy pillows can work miracles, they can get expensive. If you already have a body pillow or extra pillows around the house, use them! Position a pillow under your belly and between your legs for added comfort. You’ll be surprised how helpful a few pillows can be! If you’re really itching for a great pregnancy pillow but don’t want to spend the money, you can make your own! Simply follow a pattern and add the stuffing. A perk to this is that you can decide how firm or soft you’ll want your pillow and you can make it look the way you want. Click here for a great tutorial for making your own pregnancy pillow. I know…you’re tired and the last thing you feel like doing is a workout. What if I told you a workout was key to better sleep? Maybe you’d be more interested! Many pregnant women report sleeping better after they’ve exercised that day. Even if it’s just going for an extra walk, it’s definitely worth a try. There are tons of classes, books, and registries out there to help you prepare for the arrival of your new baby. While you can sign up for many of these in your city, sometimes it’s nice to not have to worry about leaving home! The Bump Smart Planner is the perfect way to plan for your new baby. From checklists for every month of your pregnancy to baby shower details and even daycare interview worksheets – this bundle has it all to keep you organized during your pregnancy. Did you know there are baby prep classes you can take online? In the busy world we live in today it can be hard to make a baby prep or breastfeeding class work into your schedule. Instead, you can now sit in the comfort of your own home and take a class! Birth It Up! is an amazing birthing class geared towards mom’s who want to go natural. I just went through the whole course again for baby #2 – even though I might get another epidural! The course still has great information regardless of if you plan to go natural or not. Milkology is a great (and inexpensive) breastfeeding class available to moms – all online. The Belly Only Pregnancy is the perfect class/app for pregnant moms that are looking to stay fit and eat healthy during pregnancy! By creating a baby registry you’ll help friends and family know what you really want for your new baby. Whether it’s a certain type of nursery decor, cute outfits, or a stroller – a baby registry is a must! Pssst, if you create an Amazon Baby Registry and you or someone else orders $10 worth from it – you’ll receive a free baby welcome pack full of products for you and your baby! One of the big decisions during pregnancy is deciding if you’re going to breastfeed or not. If you choose to breastfeed, I strongly suggest that you get a breast pump. The best part? 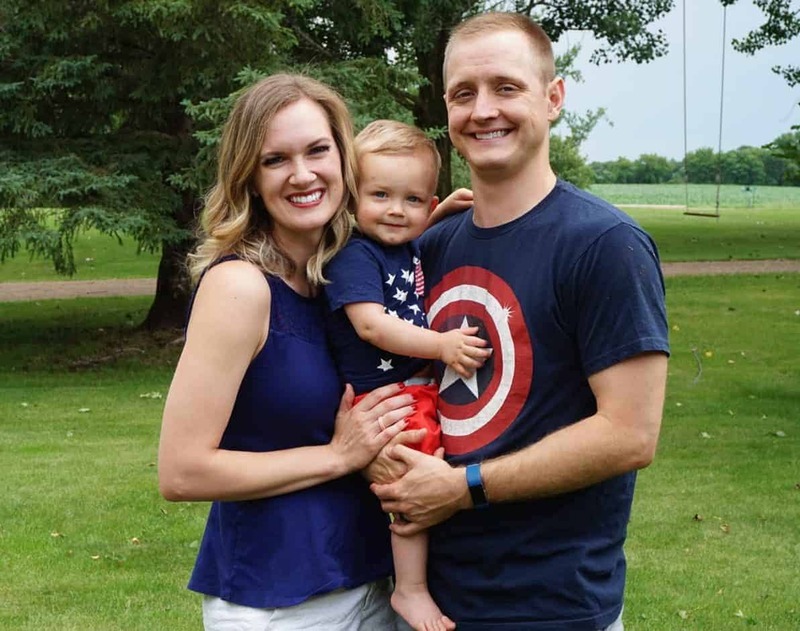 You can usually qualify to get a breast pump for free through insurance. Simply follow these steps and you’ll be on your way to a new free breast pump in no time! When you’re busy navigating breastfeeding and pumping decisions, you’re bound to have some questions. Pumping 101 is a great resource to guide you in when to start pumping, how to pump, and what to do if you’re struggling to pump breast milk. Whatever pregnancy challenges you might be going through, just remember the light at the end of the tunnel will be your sweet little baby! 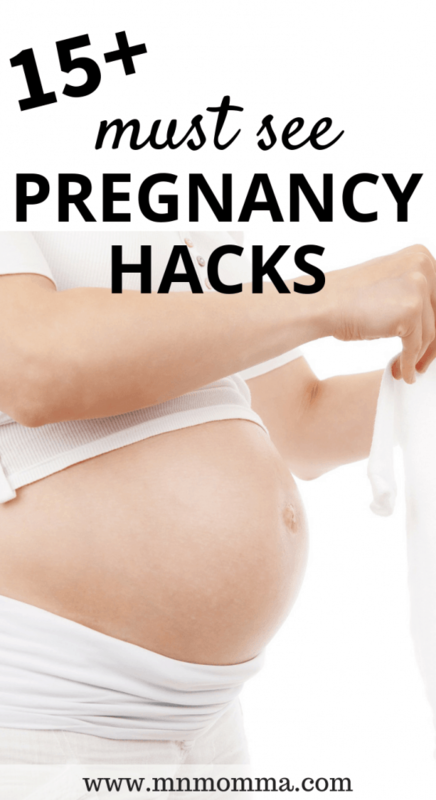 And, don’t forget these amazing pregnancy hacks either. 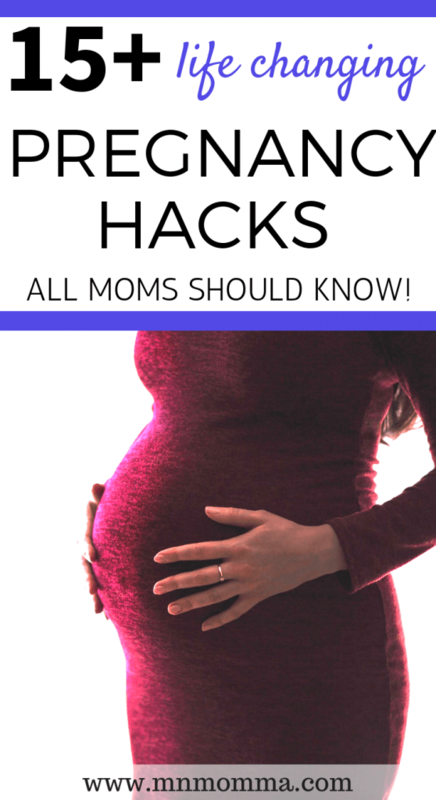 Other moms have tested out what’s worked so you don’t have to – so make life a little easier on yourself and enjoy the best pregnancy tips and tricks.